So much for the rebuild! 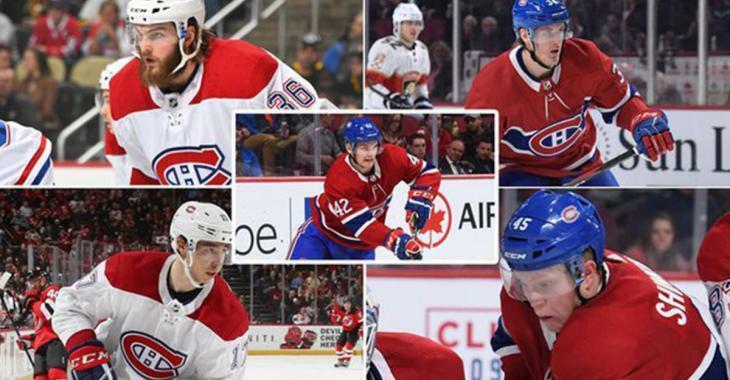 The Montreal Canadiens have placed five players on waivers this morning after making substantial cuts to their training camp roster. Hunter Shinkaruk, Michael McCarron, Byron Froese, Rinat Valiev and Brett Lernout. Michael McCarron in particular is a surprise, given that the former 1st round pick (25th overall) in the 2013 NHL Entry Draft was expected by many to crack the team’s roster for the upcoming 2018-19 season. The 6 foot, 6 inch, 230 pound winger from Grosse Poine, Michigan has played just 69 games in his NHL career so far, scoring two goals and eight points. In 54 games with the Habs’ AHL affiliate Laval Rocket last season, McCarron managed seven goals and 24 points. Another surprise is Hunter Shinkaruk, another first rounder from the same 2013 NHL Entry Draft. The 23 year old Shinkaruk was selected directly in front of McCarron at 24th overall by the Vancouver Canucks. The shifty winger was traded to the Calgary Flames before making an impact with the Canucks and then flipped to the Canadiens this past offseason in exchange for another former top prospect in Kerby Rychel. Shinkaruk has had even less of an impact in the NHL than McCarron, scoring just two goals and four points in 15 NHL games. It’ll be interesting to see if another team takes a chance on either of these players. McCarron, for his size and versatility alone, should warrant a look by a few NHL teams. As for Froese and Valiev, the depth players will likely pass through waivers without so much as a second thought from rival teams. Froese has manages just five goals and 16 points in 110 NHL games, while Valiev has gone pointless in 12 NHL games. The 23 year old Valiev was acquired by the Habs at the 2018 NHL Trade Deadline as part of a package deal for veteran Tomas Plekanec who, of course, is now back with the Habs organization. Nothing ventured, nothing gained I suppose.